StatPak-PC II installs in the user’s PC, and logs weight data from up to 10 scales into a SQL runtime database installed along with our software. 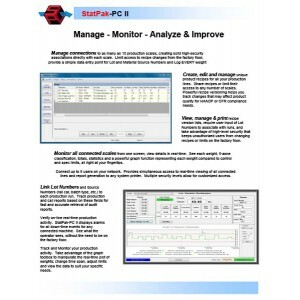 Up to 5 users on the same network can access and use StatPak-PC II simultaneously. Real-time view of production for any connected scale; weights, averages, graph of values compared to target, etc. When used with Thompson’s 4693, 5511 or 6611, StatPak-PC II stores all recipe data within its database, securing access and limiting unwanted changes to target and reject weight parameters. The operator accesses this database quickly and easily from the 4693, 5511 or 6611 on the factory floor, searching for the proper recipe, entering a lot number or source code (if required) and starts running the new production run. StatPak-PC II is automatically updated and begins storing weight data for the new run.